Update - 4/17/19 - WSA Mobile 5.5.5 is now available to all users in the Google Play store. You will receive an update notification soon if you haven't already. This release improves app performance, responsiveness, automatic scanning functionality, and battery consumption. Customers who have already installed our beta version are on the latest version. No action is required on your part. The beta group will be closed when we release the next version of WSA Mobile and you will be notified to upgrade to the latest release. If symptoms persist after upgrading to version 5.5.5, please open a Support Ticket. Update: 4/12/19 - We have issued a new build to address recent issues affecting Webroot Mobile Security users on Android. Version 5.5.5 improves app performance and responsiveness, and will address the issues some users are having with higher than normal battery utilization. This new build is being rolled out in phases to users so it may take a few days for all users to get the update. Customers who want to get the new version right away can use this link to upgrade. Webroot apologizes for any inconvenience users experienced. To see if you have already been upgraded to version 5.5.5, check the version information of the installed Webroot Mobile Security app. To do that, open the app, on the Home screen tap the Android menu button, tap About. (Japan Only) Customers who were not part of the initial rollout who want to get the fix more rapidly can open a ticket with our customer support team who can advise further. Webroot apologizes for any inconvenience users experienced. Please be aware that the Google Play store will present this app as an “unreleased version" and will prompt you to “Become A Tester”. Click the link to proceed, however please disregard the instructions and information about the testing program. Webroot will release an update to this 5.5.5 version automatically, which will remove the Beta Tester designation. There will be no additional action required on your part. By downloading and using the software in this link, you agree that such software is (1) in the beta stage of development and (2) considered “Evaluation Software” under the Webroot SecureAnywhere Solution Agreement that governs your use of the Mobile Software. Update: 4/10/19 - Testing – We are making progress on the issues regarding the Webroot Mobile Security and Antivirus Android app. Thank you for your patience while we are continuing to work on fixing this issue. Our latest test build improves app performance, responsiveness, and scan times but we are still working through one blocker. Before we’re able to release this app to everyone in the Google Play Store, we still have some additional testing that needs to take place. We will keep you updated with any changes. Again, sorry for any inconvenience you may have experienced. Identified - We are aware of an issue regarding the Webroot Mobile Security and Antivirus app. Some Android users have reported an increase in CPU usage and battery consumption. This issue has been identified and is being investigated. Impacted users are still protected and there is no action that needs to be taken at this time. If you are experiencing this issue, please leave your Manufacturer, Device, and Android version information below. For more information, please contact our support team here. I have been experiencing this battery drain and high CPU issue since the last Webroot Mobile update. I have already submitted a Support Ticket hours ago. Phone: Google Pixel (1st generation), Android 9 with April 2019 Security Updates applied soon after 12 am April 2. I did notice the phone getting unusually warm sometime after SecureAnywhere was updated yesterday, but have not experienced it since last evening. Attached screen capture shows SecureAnywhere battery consumption of 28% while my other apps stay in the single digits. Interesting to note in the screen capture that the amount of time used by SecureAnywhere and Google Play Store are high. Don't know if they're correlated or not, or in conjunction with applying/optimizing Android April 2019 security patch. Thanks for submitting a support ticket. This is very helpful! @Virtualpb may I ask if you have received a Webroot update from the Google Play Store? I went and reinstalled Webroot and when I went to click install I saw a box that said update. Which I clicked on. But I didn't see a version change either. So far Webroot is behaving but time will tell once I disconnect my external charger. I just updated yesterday when I checked the Google Play store and saw an update (app details showed Mar 28, 2019 with the same What's New message from your pic). I did not uninstall/reinstall. The last time I uninstall/reinstalled was a few weeks ago when I went from beta to the production version of the app. Actually, I do notice that alot of my apps have frequent updates recently on the Play store. I don't know if there's version change or not but I remember thinking "didn't I just update this app yesterday/a few days ago?". I think I have also seen in the notification logs that the Google Play services sometimes update apps in the background even if I have the setting NOT to automatically update apps. But I can not verify since the logs do not go back far. 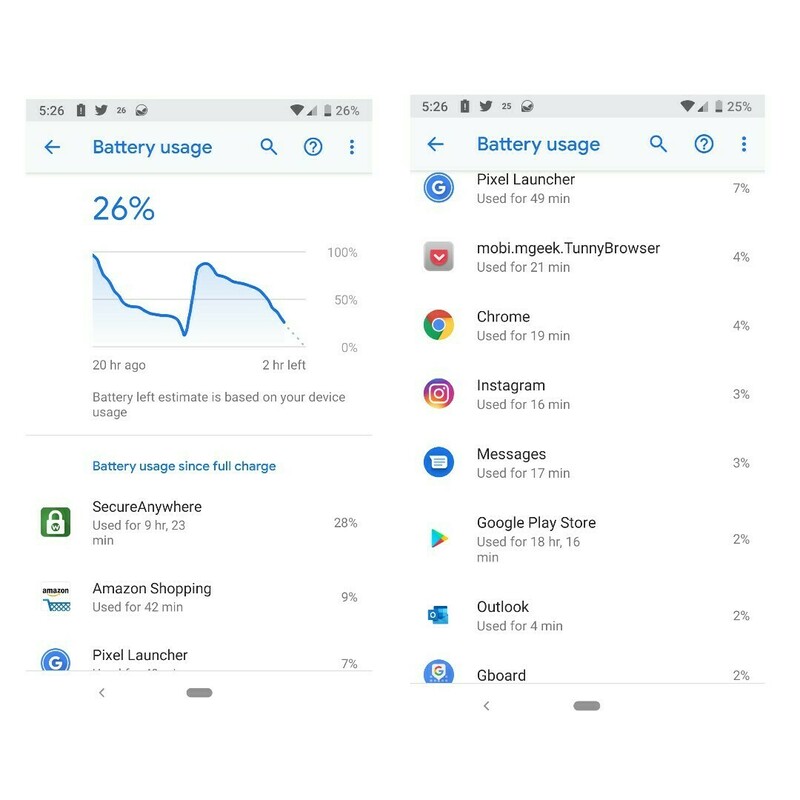 Samsung S7 running on Oreo, consumed 64% of battery after a night. No draining issue on my newer phone Huawei P20 Pro on Pie so far, but having Error Code 1011 Limited or no connectivity (which already been discussed during beta, but no follow up ). Thought everything back to normal after quitting Beta channel & going back to release channel , nightmare again after the new release version v5.5.4.36995. Seems to have been an update over night I've just down loaded and installed this version:- Ver.5.5.5.37711 checking how it goes! I'm looking for it but my phone doesn't see this version 5.5.5.37711? Same here, cannot locate this version on two phones. Our development team is aware of this issue with the latest mobile app update and is currently working on a fix which will be released as quickly as possible. We do apologise for any inconvenience caused, we will look to have this issue corrected soon. Please let us know should you have any additional questions. I currently have Webroot SecureAnywhere uninstalled. It is just burning up my battery. It seems or possible that Webroot may have pulled that version? Could it be a beta version? I joined the Beta again and it looks like your version is the Beta because that's what I just installed. 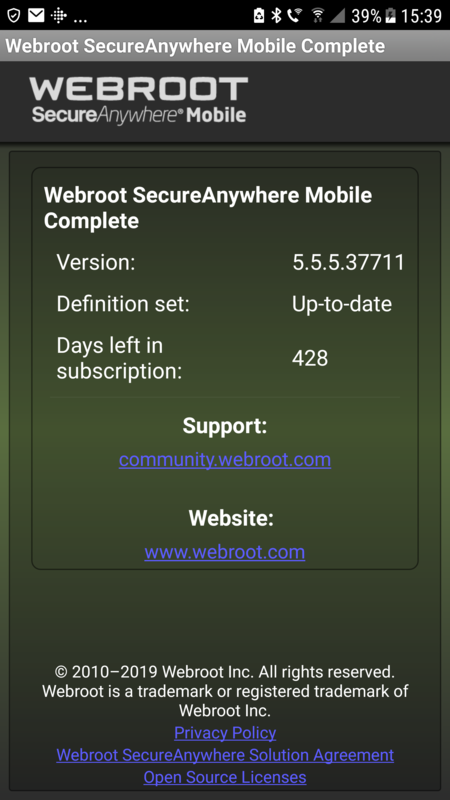 Now I need to check what the release is again..
@smith2006 , The Webroot Mobile Security Release is still the same which means it has not updated ..
Mystery solved ...Thank you smith2006@smith2006 , The Webroot Mobile Security Release is still the same which means it has not updated .. Does using v5.5.5.37711 Beta solve any problem (I have yet to re-join the beta group) ? You are welcome! My phone is starting to get hot again. But I haven't got a CPU popup yet. I will know more in the morning after I charge my battery for the night. But this version so far is heating up my device. 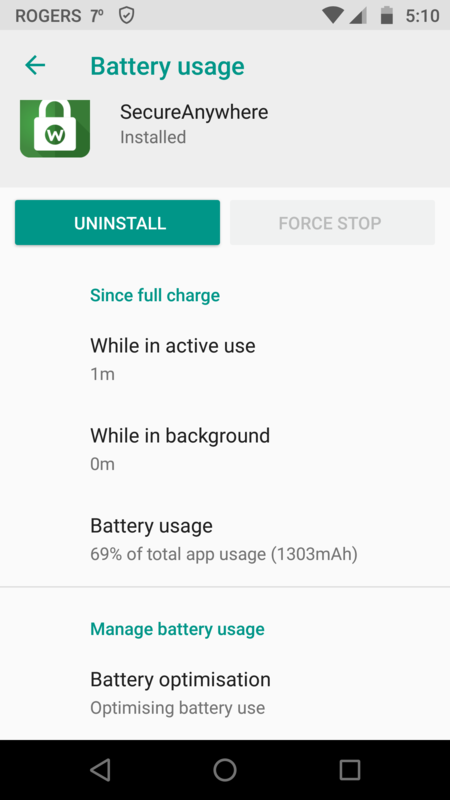 When I installed this Beta my phone had 40% battery left. I'll be back tomorrow with more news.. 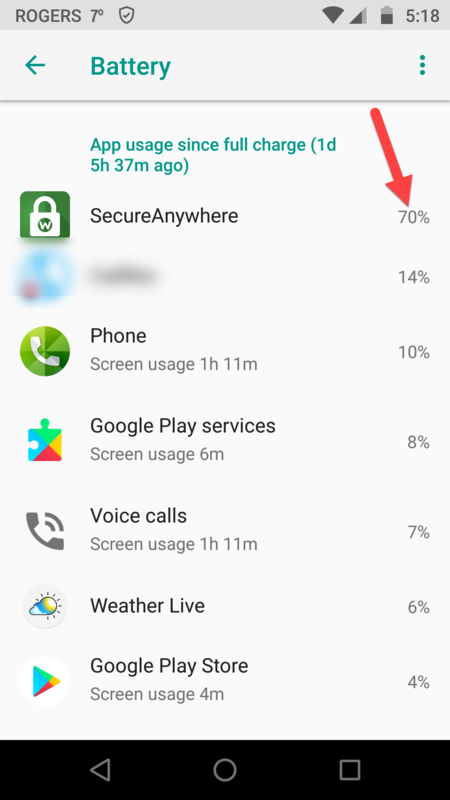 I am also experiencing very high battery consumption of Webroot Mobile SecureAnywhere v 5.5.4.36995 since recently updating it , as others on this forum and on the Google Play store have reported. I also notice the phone getting unusually warm ever since SecureAnywhere was updated. It gets especially hot when charging, even under slow charge (from the computer). SecureAnywhere fully drained the battery more than once, when I wasn't looking. Since last fully charged, SecureAnywhere battery consumption is 154% while my other apps stay at 1-2%. Samsung, note 8, android 8.0 power issue after most recent update and a random notification on the app icon that wont go away.